Where is the cheapest crude oil in the world? And how low can you get that barrel of oil? WTI has declined to $30 per barrel, the lowest level in more than 12 years. But heavy oil producers in Canada would love to have $30 oil. The price for a barrel of bitumen, the tar-like oil sands that comes from Alberta, fell to just over $8 per barrel this week. That is not a typo. Bitumen traded at $8.35 per barrel on Tuesday. Single-digit oil prices for oil sands is not just a problem, it is an existential crisis. That is because heavy oil is some of the costliest stuff around. Bitumen production is way more expensive than oil from shale. Consequently, it is shut-in time for some producers. Leaving aside the massive cutbacks in spending and the future oil production that will not be realized, Canada could start posting some serious production declines from existing sources. Simply shutting down an operation probably makes more sense than selling oil at a loss. But some companies might stay online and lose money because shutting down carries its own trouble and costs. Shutting down can actually damage a reservoir, leaving a site with permanently lower output. As a result, production shut ins could actually be “extremely limited,” Martin King of Calgary-based First Energy Capital recently told an industry conference. if they can find Banks willing to take a "long "position that will allow them to have a non-expanding debt load and interest only payments on a loan, they might be able to withstand the low price cycle until opec led by Saudi Arabia can get world producers to curtail production and elevate prices to a point where all producers are making some money. Or perhaps the shutdown of higher cost producers is what they ( Saudis ) wish to achieve until these companies are bankrupted, and they can buy the assets at a firesale and shut down competing production forever. My new oil system to push up oil prices. People buy a barrel of oil as shares. The oil doesn't get pumped out the ground in the knew Russian system. Russia, Iraq, Iran, South America and the rest will pre sell barrels of oil as shares. If $29 billion dollars is invest in barrels, the government get's their money "without" pumping it out. The share holders make a big return fast, because the price is going to skyrocket with the outlook showing 65% less oil to run the world economy's in 2 weeks time. At $30 a barrel $30 billion dollars would stop 1 billion barrels of OIL on the market. They pre buy the oil and the second Russia, Iran, Iraq,South America and the rest don't pump out 12 million barrels a day for 1 week, is the second the economy goes nuts because in 2 weeks time, the economy will run dry. The outlook is going to show an economy that has no oil or missing a massive %. That is going to make oil like gold. The oil country's that need that money to run there country, get it instantly without pumping out oil. This system can turn oil into gold and 100% will. 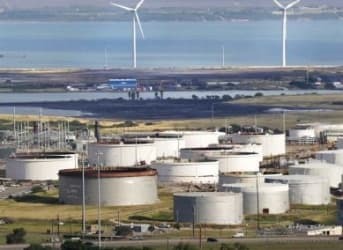 How can after years of screwing consumers with the artificial high price of oil did the US oil producers not see DEMAND lowering its head in an attack stance? Since 2006 US consumers tired of paying their hard earned money at the pumps took steps to reduce their dependency on gas. The decision to double down on shale, fracking, and drill baby drill when US consumer demand was dropping to the tune of 1M barrels/month. US is in a turmoil no thanks to oil producers who are making very bad decisions and bringing our equity market with it. I am looking forward to the day when the US sheds OIL and adopts renewable fuel choices like ethanol & methanol. Our vehicles can run straight ethanol & any blend with or without gasoline with just a software change. Older than 1996 devices can be hooked up to accomplish the same thing. Brazil has not only been doing this for over a decade they've made the change converting their diesel running vehicles over to ethanol. Why is the US hung up over dirty gasoline when we can run completely clean ethanol and save our planet? LOL, and you already know the answer. How much natural gas, oil and coal is used in the production of one gallon of ethanol?